SAN ANTONIO – Winning is nothing new to Michael Norman. Winning The Bowerman, collegiate track & field’s highest honor, definitely is. Norman capped an undefeated, record-breaking sophomore season by capturing The Bowerman on Thursday night inside the Grand Oaks Ballroom at the JW Marriott San Antonio Hill Country Resort & Spa during the USTFCCCA Convention. He edged former teammate Rai Benjamin and Florida’s Grant Holloway for the award. 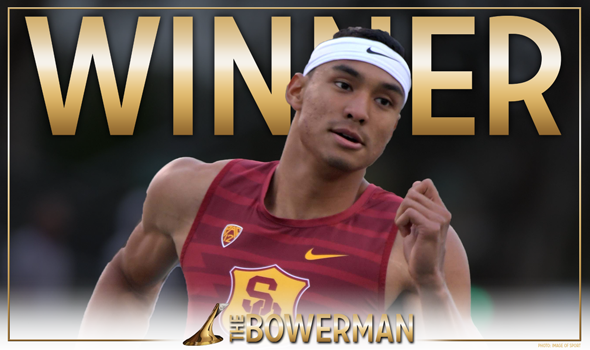 The sophomore from Murrieta, California, left five records in his wake during the 2018 season on his way to being the first winner of The Bowerman in Southern California program history and the first male athlete from the Pac-12 to take home the award since Ashton Eaton in 2010. Norman scorched the oval during the indoor season first, breaking a world record and collegiate record in the indoor 400 and leading the Trojans to an all-time world best in the 4×400 relay. He then turned his attention to the outdoor circuit and blistered the track. It was at the NCAA West Preliminary Round when he clocked the second fastest 4×400 relay carry in world history at 43.06. Two weeks later, Norman unified the 400-meter collegiate records when he ran 43.61 in a winning effort at NCAAs and anchored USC 4×400 relay team to a collegiate record-setting time of 2:59:00 to sweep those titles.